With the new year comes the expectation that changes will take place for the better. Many people reflect on the past year and choose new goals to be accomplished during the following one. It’s a great time to determine what is most important in your life, what you want to improve on, and how you can secure the prosperity and peace of your future. Of course, every resolution is based on our willingness to change something about our current lifestyle or behavior that hasn’t allowed us to reach those goals (just yet). Making a list will help us stay on track and serve as a reminder for the months to come. Thinking back on the previous year, we can contemplate the devastating effects of natural and manmade disasters. Hurricanes blew cities apart on the east and southeast of the United States. Fires ravished entire communities, such as Paradise, CA. Earthquakes dismantled cities, particularly Indonesia. And terrorist attacks were committed against innocent people, some of which were the shooting at the Borderline Bar in Thousand Oaks, CA and the shooting at the Christmas Market in Strasbourg, France. These are only a small handful of crises that were experienced in 2018. Perhaps this year your life was personally affected by a disaster, or you know someone who was. We are not immune to tragedy, whether it comes at the hands of man or nature. Yet in order to live our best life, we should be prepared for the future regardless of what it holds. There are several reasons why preparedness is important. I will go into four of the most common ones. 1. Reduced anxiety or fear about the uncertain future. Preparing your family with bug out backpacks, food storage, and water supplies, will give you peace of mind. When we practice preparedness, we are better able to behave and cope with crisis situations as well as assist others. 2. Becoming empowered by being self-reliant. Whether you find yourself in a wilderness/ hiking emergency, or a mass catastrophe has taken place in your town, you should at least have the skills and supplies to keep you alive through the first 3 to 7 days. 3. Local government relief is not guaranteed. The first 72 hours following an emergency are the most critical. Law enforcement, disaster relief organizations, medical teams and the government will be overwhelmed with meeting the needs of the people. We should never assume that they will be accessible nor able to assist us right away. It’s vital that you have the appropriate supplies to meet your own needs until help arrives. 4. Minimize the amount of loss. One of the greatest tragedies amidst a tragedy is losing a family member, a pet or valuable possessions. In the Camp Fire for example, many lives and possessions were lost to a fast-moving fire that didn’t allow people to properly evacuate. If you’re prepared, you have a better chance of reducing the risk of loss by knowing how to respond in such disasters. Involving your children in the preparedness process is key. In the coming year, I hope that you will remember to prioritize preparedness on your list of resolutions. What a responsibility we carry in providing for the safety of our families. Although we can never be too prepared for everything, there’s a lot that we CAN do. Wherever you are in your preparedness process, this list of goals will help you determine where to focus some extra attention and time. 1. Update your emergency contact numbers. We may not be with your closest relatives or friends when an emergency strikes. Make sure you have all their contact information up to date. It’s a good idea to also discuss communication methods if the internet is down or phone towers stop working temporarily. You can learn more here about alternative communication methods when you can’t rely on cell phones. 2. Update your emergency binder. Your emergency binder contains the important documents that should be protected at all times, especially in the event of a disaster. This binder should be updated at least once a year or ideally when you make significant changes to any policies, wills, a pet is adopted or a baby is born. Read this blog to learn which documents should be saved in the emergency folder. You can also print the free guide! 3. Update your emergency response plan. Oftentimes when we are unprepared for an emergency, we act out of fear rather than clear thinking. It’s a natural response to act this way if we’re under a lot of pressure and stress. By creating and practicing an emergency response plan, we can train ourselves to act proactively in the event of any disaster situation. Involve your children in this process too. 4. Determine a bug out location. We should have a backup location in case we have to evacuate our homes or cities. Establish a reunification location with your loved ones, in case you become separated at any time during the emergency. A good idea would be to store some survival supplies (such as long-term food storage, water, first aid, blankets and an extra change of clothes) at another location in a different city, such as a relative or friend’s house. In return, they can store similar supplies at your house. This way, if an evacuation were to take place, you would have somewhere to go and supplies readily available to you. 5. Survey your house. Do a walk-through of your house and check the batteries of your carbon monoxide and smoke detectors. These batteries should be changed once a year. Then, determine what furniture and appliances need to be secured based on the disasters your home is more likely to experience. If it’s flooding, it would be a good idea to invest in waterproof containers to secure valuables. If it’s earthquakes, secure TV’s, re-arrange your children’s bedrooms if necessary (so their bed is not underneath a shelf) and strap your furniture to the walls. Make sure your home is as emergency-proof as possible. 6. Review your insurance policies. Over the course of the year, our insurance needs or budget may change. Review your home insurance, fire and flood insurance, life insurance, and medical insurance to make sure you and your property are covered. 7. Update all your emergency kits. Since the shelf-life of products change, we must go through out kits (such as a first aid kit, bug out bags, and car kits) to rotate any items that are expired, expiring soon, or no longer necessary. If you have a baby or toddlers, you may need to update their bug out bags a couple times a year to appropriately meet their needs. (Note: If you have diapers that your baby no longer fits into, put them in your first aid kit to use as bandages rather than throwing them away.) If you have any medications in your first aid kit, make sure they’re still safe to ingest. Check the batteries in your bug out bag and car kits, as they also have expiration dates and temperature fluctuations can alter their shelf life. If you don’t have any emergency kits, now is a good time to make or buy one. 8. Rotate your food and water supplies. Food and water should be rotated several times a year. Always check the expiration dates of your food storage and rotate as necessary. If you purchase long-term emergency food storage, you can store those meals safely for the next 15 to 25 years. If you want to build your own food storage supply, check out this guide to learn which foods have the longest shelf life. Also, this blog will help you determine if your canned goods are still safe to eat and which temperatures are ideal for long-term storage. 9. Learn to grow your own fruits, vegetables and raise farm animals. The new year is an opportunity to get creative. Try something new with your garden! If you don’t have a garden, learn how to grow a few of the essential survival crops. Successful gardening will take some time and trial and error. Be patient with yourself and stick to it. If you live in an apartment or live in a place with huge temperature fluctuations, try growing veggies inside in pots. If you have the space outdoors for a garden, try to section off an extra area to raise a few chickens or pigs. Chickens will give you a healthy supply of eggs and pigs can eat virtually anything (so your leftovers never go to waste) and they can become dinner in an emergency situation. A fun thing to learn would be how to create an aquaponics system at home that uses your fish tank to grow lettuce (or your favorite veggie). 10. Learn to preserve your own food. There’s nothing better than home prepared food. If your garden yields a large quantity of food or there’s a super sale on produce at the market, take advantage of it all by learning how to preserve the food long-term. Canning and dehydrating are two methods that I recommend you start with if you haven’t done this before. 11. Experiment and learn alternative cooking skills. If you’re bugging out or there’s no power for a while, you will have to learn how to cook differently. Learning some new cooking methods now will help you become more flexible in preparing meals during emergencies. On rainy days, practice baking bread or pizza from scratch. During the winter months, our family grills meat inside the wood fireplace as an alternative to grilling outdoors in the cold. Other cooking styles include one pot (or crockpot) meals, using a thermos, a camping stove or a sterno. 12. Gain financial freedom in 2019. One of the best feelings in the world is the freedom in being debt-free. Becoming debt-free means adjusting financial goals, budgeting and sticking to them. Once you have paid off your debt, you have the opportunity to save money for a future crisis. Ideally, you want to save enough money to cover six months’ worth of expenses. I wrote a guide to help you develop practical strategies to get out of debt and start saving your hard-earned money. You can find the guide here. 13. Invest in precious metals. Gold and silver are two metals that don’t fluctuate much in their worth. Rather than investing your money in cash dollar bills or stocks and bonds, invest in precious metals that may be worth about the same or more than you originally paid for them twenty years down the road. 14. Start budgeting for long-term goals. Solar panels are very expensive up front, but if you budget a certain amount every month, you may be able to install solar panels in your home in the next year or two. In turn you will save a lot of money in electricity. Long-term food storage can also be a costly investment for many people. Determine which type of food-storage option is ideal for your family and set aside some money from each paycheck until you’ve earned enough to purchase it. 15. Invest in emergency lighting. Power outages are very common no matter where you live in the world. If you’re caught in the dark, have some light sources accessible in different places around your house. Light sources can be tea lights, candles (with matches), flashlights (with working batteries), or solar powered lighting. 16. Get in shape. I’m sure most people put this on the top of their resolution list every year…I know I do! But other than becoming healthy and strong for ourselves, we must think one step further for the people around us. If you’re caught in an disaster situation (a fire or earthquake for example), would you have the strength to pull a person taller or heavier than you out of the building? By becoming strong, there’s a greater probability that you can help bring someone to safety, especially if their life depends on it. 17. Take combative skill training. Manmade disasters and attacks are commonly featured on the news. No matter where you are, you may be confronted with a knife, a gun or a fist by a perpetrator. Be mentally and physically prepared to defend yourself at all times. Learn to become fully aware of your surroundings when you’re in public (this means putting your phone away sometimes). Some great self defense skills can be learned in krav maga, krav-jitsu and jiu jitsu. Check what self defense classes are offered near you. 18. Get trained to use weapons. Learning to use guns are not just helpful for self defense but also for hunting. Archery would also be fun to learn for hunting purposes. 19. Get certified or re-certified. This year, make it a priority to be self-reliant in protecting your family. Whether or not you have been certified in CPR and First Aid it’s always a good idea to take a refresher course once a year. Getting certified in HAM radio can be very beneficial in an emergency scenario when phone lines are down or cell phones aren’t working. A free emergency preparedness training is offered by your local CERT (Community Emergency Response Team). CERT is an organization that has active participants in most cities throughout the United States. 20. Have a monthly drill. Schools periodically have drills to prepare students in the event there is an earthquake, tornado, active shooter, or other emergency. This is a great habit to form in your own home. Pick one day every month to perform an emergency drill. Choose a different drill type or location each month. It’s wise to practice drills when you’re out in town, either at a grocery store, at a restaurant or the movie theater. When you’re in town, learn to become fully aware of your surroundings, observing which exits you have nearby, and how to reach a point of safety if your life is endangered. When you’re with your children, ask them “What if there was an earthquake right now? What would you do?”. Use different scenarios to practice safety everywhere you go. 21. Have a blackout long-weekend. Emergencies don’t typically occur during perfect weather conditions. One creative way to prepare for a bug-in situation is to have a blackout weekend. This means that you keep your power turned off for 24 to 72 hours (or as long as you want!) Having one blackout weekend in the winter and one in the summer will open your eyes to what needs you may have in extreme cold and extreme hot weather. Using the knowledge you acquire from this experience, you’ll be able to prepare a bug-in and bug-out kit with all the equipment that you found was absolutely necessary. 22. Go camping at least once every season. Seasonal camping is exciting because you will need to learn to adapt to the changing environment. When you’re camping, you can learn how to build a shelter (in the rain or snow), how to start a fire and cook a meal outdoors, how to stay cool (in hot weather), foraging in the wild and orienteering (whether it’s with a compass or with the stars). This is a good opportunity to become familiar with the gadgets you have in your bug out bag. Bringing your kids along will become a great learning experience for them, even if you decide to go camping in your backyard. 23. Learn a new prepper skill or improve one. 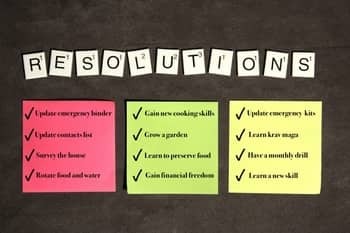 This new year make it a priority to learn a new skill, preferably something that can help you in a survival situation. Perhaps you need to learn how to use a chainsaw, how to change a tire or start up a dead car battery. Learn where your utility shut-offs are located (water, gas, and the electrical panel) and how to turn them off. 24. Get your neighbors involved. Get to know your neighbors and their basic needs. Perhaps there’s an elderly person who lives alone nearby and will need your help during an evacuation. Exchange contact information with them in case there’s an emergency. 25. Join an alert notification system. Download an app, tune in to your local radio station, or opt-in to receive emails from your local weather broadcast or emergency organization. This year, stay updated with the storms that may be approaching your home and be prepared to evacuate when required to. Although this list may look overwhelming to tackle, the secret to accomplishing everything is taking these goals one step at a time. Today you can start by printing this list and highlighting the priorities for your family. Then, pick two goals you want to accomplish per month and write them on your calendar as a reminder. Don’t give up on yourself if you fail to accomplish something. Just do the best you can. I often get asked: “How can I start preparing for a disaster?” Preparedness is not limited to a kit or a bucket of food, but rather it’s the ability to meet all your personal needs and survive in less than desirable circumstances. No crisis situation is going to look the same, but your supplies, knowledge, and skills will help you overcome any challenges you face. This list of goals will give you an idea of the things you can start working on or improve. Resolve to be prepared in 2019! 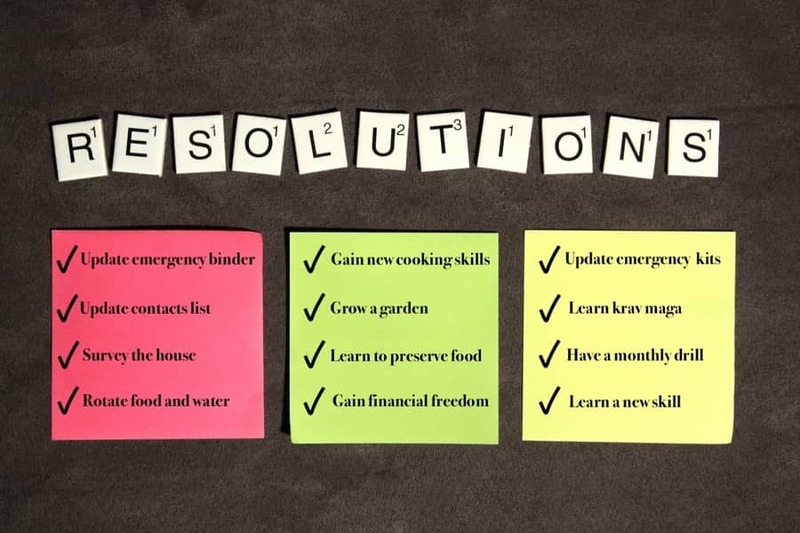 Which resolution goals are on your list this year? Let me know in the comments! 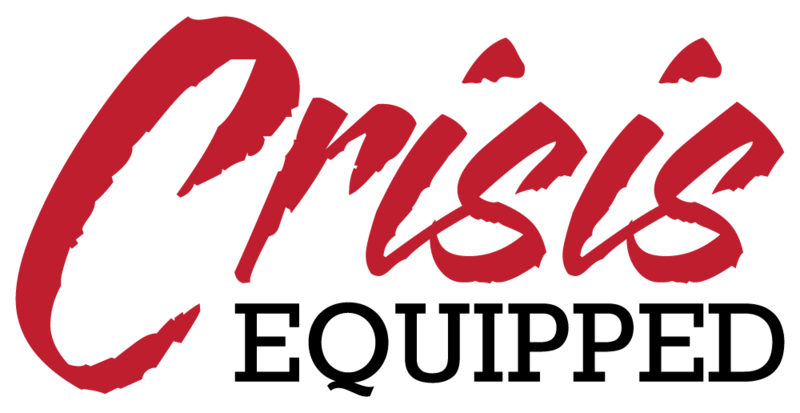 Sign up to receive blog updates straight to your inbox! Under learn to preserve your own food. What fruits or vegetables to you suggest that are nutritious and economical? We would recommend you go with seasonal fruits and vegetables. Take advantage of deals and use coupons whenever possible. Also, you might want to check if you have Latin or Asian markets in your area. They have amazing varieties and their prices are also budget-friendly. Very thorough article as usual. Regarding canning, i have only canned jams and jellies. What fruits or vegetable would you recommend canning, for nutrition while limiting cost? Thank you for the encouragement. Canning jams and Jellies is a great start. As far as fruits and vegetables goes, almost everything can be preserved one way or another, but when it comes to nutrition values we recommend all the natural fermentation process like SauerKrout, raw unfiltered apple cider vinegar, kombuchas etc. Also, consider milk or water kefir, pickled vegetables, and chutneys. We hope to blog at some point about some amazing homemade recipes. When purchasing, go with seasonal fruits and veggies. Check offers and use coupons when possible. Another great resource are Latin and Asian markets. Their variety is amazing and prices are usually budget-friendly. Hey this was a great read! More great blog to come.